It wasn’t too back in time and it isn’t dated in memory. As such, it isn’t a childish memory. Only childlike. But it still was a good day, fresh in my heart as if it were only yesterday. This was the day when two hearts met through some thought-out planning and some cheerful, harmless mischief. This was the day that I realized, when things are right in life, you must go about and shout #KhulKeKheloHoli. I hadn’t met her for five years. It’s not a small time and things do get between two people that make their relationship less nurturing, less fulfilling and finally, tough to carry on. As that, it had been months we hadn’t talked, nor had we exchanged pleasantries on Birthdays even. Bizarre things were starting to happen in our lives and neither of us saw any way out of them. Things weren’t bad or sad. They just were saturated, not leaving time or space for that soft corner you have for special people in life. But that Holi, things took a change for the better. Anyway, so as I made my way through the street to her door, I heard an unknown voice call a very known name. Sadly, you wouldn’t get the name here 😛 . And then, a very known voice responded to the very unknown voice as my heart knew no bounds. It was she and she was there. I had made all this plan of coming to her house and surprising her on HOLI on the paper-thin premise that I knew she was having a good amount of holidays at her college and so there was more than a fare chance that I would be able to find her at her place, at her home. I rang the bell, although the gate wasn’t really shut as a symbol of welcoming guests wholeheartedly on Holi. But I was an uninvited guest and so I had to. Her father came to answer the door as I wished him Namastey, touched his feet and went on to put just a little ‘teeka’ of gulaal on his forehead, wishing him a very happy Holi. At that very moment, that respected man right there had an expression on his face that spelled a thousand emotions but was blank in words. He had never seen me before and was befuddled as to who this unknown guy was, behaving as a long lost son (or maybe one wanting to be 😛 ). To clear his confusion, I told him my name and that I was his daughter’s friend. Maybe he understood the situation then and called out to her. As he did, she came running to the door and when she saw me, she was flabbergasted. 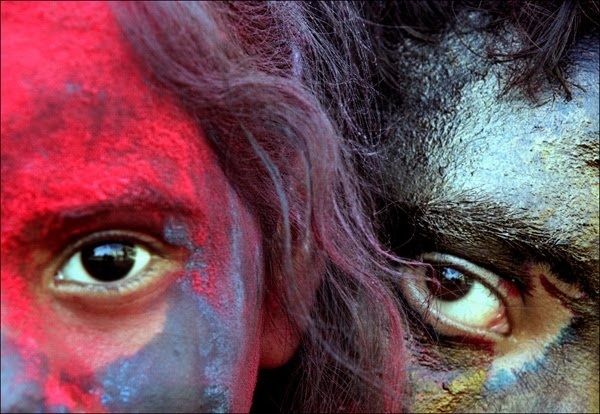 But before she could come over to wish me a happy Holi, it was her mother who came forward first, maybe because the real gravity of what was happening had dawned upon her. Her mother came up to me and I again touched her feet, wishing her a Happy Holi as I applied another little teeka, this time a green one, on her forehead. Her mother gave a ‘knowing’ sort of nod to me and then to her husband as they welcomed me in. On the way in, I simply wished her a happy Holi and did not even bother to put any colour on her. Maybe we thought it would be rushed. Maybe we thought that there would be a better time. She made me sit at one of the chairs they had put in their verandah for guests as her father came in with his plate of colour. He called me by my name as I got up to his call. He first put a teeka on my forehead and then proceeded to apply some on my cheeks and chin too. He then did something that made his daughter’s eyebrows go wide. He put down the plate and hugged me a very happy new year, something that was although customary on Holi but something that she wasn’t expecting. She offered me some of the Holi snacks that she must have set on the table beforehand. I took the smallest looking thing from amidst the box and put it into my mouth. Soon her mother came in carrying a glass bowl in her hand. As she came near, she put the bowl on the table and picked up the plate of colour in her hands. Seeing her stance, I got up again as she put a teeka of red on my forehead, just a little one and brushed off some of the green her husband had applied. She then handed me the bowl containing a halwa, one which I was later told she only reserved for ‘special guests’. I sat there on the table, trying to act as calm and composed as I could as her parents asked me a little of here and there- that we went to school together, that I used to live in the neighboring muhalla and so on. A little while later, as I got up to leave, she came up to me with her own colour plate and put a teeka on my forehead. I wished her a happy Holi and did the very same to her. Her parents saw this but didn’t seem bothered. And then her mother said something that made our day. She told her that she may go out to play Holi with her friends, now that all the preparations at home were almost done. She rejoiced in herself but didn’t really show it. She just made her way to the door as I once again touched her parents’ feet and bid them goodbye. I found her parents especially smart in that they did not bother to come to the door as she exited and I followed. As we got out, she gave me a ‘This took guts’ sort of expression but she never gave any sign that looked negative in any way. She looked rather happy and as we moved away from her house and towards the park where her friends would be playing, the complete joy of the festival came upon her. I loved to finally see her that happy and thought in my mind that I had finally made a decision I will look back with the softest of memories. Once in the park, the complete assault of colour began. I realized that the teeka she had put earlier was just a ‘teaser-trailer’ in the long long film to come. We played with gulaal, the ‘kaala-wala’ colour, water and water balloons and what not. And while we did all that, we were least bothered about getting it off later on. All we cared was to get those colours on and to get those moments in. That day right there was one that had made everything right as we played Holi #Khulke all morning.